We headed out of town to celebrate Jilda's birthday. We had fun, but by this morning, I was ready to be home. On Thursday, we drove through a monsoon. I'm guessing the area got 4-5 inches of rain. We learned when we called Jilda's brother who lives next door, that he dumped more than 4 inches of water from his rain gauge. 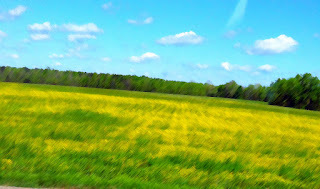 The upside was that the rain washed much of the pollen away. Today I shot this photo with my iPhone as we passed outside of Tuscaloosa, Alabama. 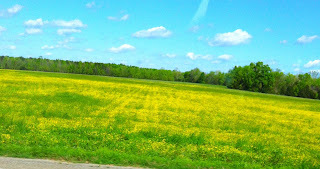 This past week, the atmosphere seemed to be hazy with pollen, but today the sky was as blue as a well-kept aquarium. I'm not sure what kind of flowers were blooming, but I suspect they are what we used to call, bitterweed. Tonight, I couldn't leave well enough alone, so I doctored the photo up with Photoshop just for fun. It gives the photograph an Impressionist feel. Both Jilda and I are weary, so I'm guessing tonight we'll hit the hay early. I hope y'all have a remarkable weekend. nice pics and happy birthday miss Jilda!.. Gorgeous picture! Glad the pollen is gone for awhile. Happy Birthday, Jilda, and I hope you and Rick had a great time...love the doctored up landscape...surreal! Nature always seem brighter after the rain, wouldn't you agree? Hope you and your wife had a lovely trip and birthday celebration. The green and yellows of Spring are just beautiful, aren't they!